100% pure essential oils deserve 100% pure natural fiber wicks. Of all natural fibers, wool is known to be the most absorbent. With the capacity to hold liquids up to one third of its volume, these small wicks can hold as much oil as other wicks twice their size. They will provide long lasting absorbency and can be reused. However, as many oils leave a natural musty residue, you’ll want to test your wick before adding more oil. 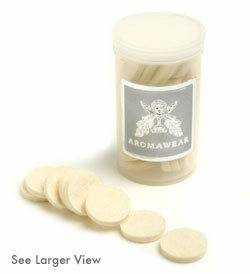 These top quality wicks are affordable and disposable, so when in doubt, throw it out! Price: $10.00 SOLD OUT - Stay tuned for the new collection!